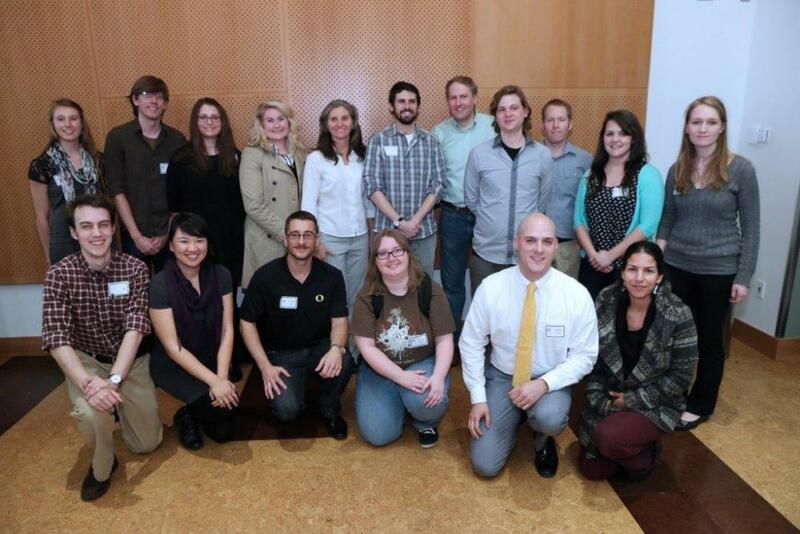 Eighteen University of Oregon graduate students were awarded cash prizes Friday for their panel and poster presentations at the sixth annual Graduate Student Research Forum. More than 150 students participated in this year’s forum, which was organized around four themes that highlighted the impact of graduate student work: Science and the Social Good; Academy, Race and (In)Equality: Bridging Research and Practice; Human Rights, Development and Sustainability; and Imaginative Design, Art and Performance. The day-long event showcased the research and creative works of graduate students representing over 50 disciplines in the humanities, social sciences, natural sciences and professions. The Grad Forum featured 13 interdisciplinary sessions, a number of artistic and creative works, and a two hour poster session, followed by an evening reception at the Barn Light Café. Science and the Social Good – “Water, Our Planet’s Most Precious Resource,” Thomas Ptak, geography; Pollyanna Lind, geography; Andrew Dutterer, environmental studies. Human Rights, Development, and Sustainability – “Gender, Human Rights, and the Paradox of Statelessness,” Sarah Hamid, media studies; Lindsay Massara, international studies; Crystal Brown, political science. Imaginative Design, Art, and Performance – “When Words Meet Music: Robert Schumann and the Different Dimensions of Musical Poetry,” Alexis Smith, German; Hui Ling Khoo, music performance; Andrew Pham, music performance. Annie Chiang, Lindsay Rasmussen, Ashly Tuffo, Eric Schmidt and Ryan Dirks, architecture, "An Energy Analysis of The Stellar Apartments." Katherine Chrisinger, counseling psychology, "Exploring Variability in Impulsivity and Its Relationship to Adolescent Risk Behaviors." Matthew Goslin, geography, "Carex nudata (torrent sedge): An ecosystem engineer facilitating river restoration." Jason Hubbard, psychology, "Looking for the Heart in the Brain: Neuroimaging Analyses of Life-Span Differences in Charitable Giving." Kate Karfilis, biology, "Vascular Endothelial Growth Factor Regulates Cardiac Trabeculation through Bmp10." Emily Martinez, computer and information science, "Investigating the Structure of Antibody Networks." Leilani Sabzalian, critical and sociocultural studies in education, "Beyond ‘Business As Usual’: Using Critical Storytelling to Engage the Complexity of Urban Indigenous Education." Joseph Wekselblatt, biology, "Large-Scale Imaging of Cortical Dynamics During Sensory Perception and Behavior." People’s Choice: Matthew Napolitano, anthropology, "Before the Clock Runs Out: Archaeology In the Face of Erosion on St. Catherines Island, Georgia, USA." This year, an estimated 250 people attended the Graduate Forum at its new location in the Ford Alumni Center. Participants were given the opportunity to network with other graduate students, faculty and community members and practiced presentation of their research in a competitive conference setting. "This kind of exchange, a multiplicity of ideas and thought processes, makes my work stronger, more attentive, and better situated in the world," panelist winner Lindsay Massara said. "I also now feel as though I belong to a community of scholars — my own peers and colleagues — who lift one another up and celebrate scholarship while pushing each other to explore and analyze further."